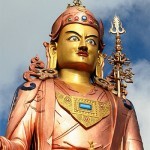 Places to see at Namchi: Perhaps, the most striking piece of attraction of Namchi is the 135 ft high statue of Guru Padmasambhava on Samdruptse Monastery located on top of a rising hill. Ngadak Monastery, another piece of attraction is one of the oldest in Sikkim and belongs to Nyingmapa Buddhist sect. Other attractions include Solophok, which is still under construction and is expected to house the replicas of the ‘Chaar Dhaams’, the pilgrimage sites of Hindus. Then there is also the Kanchanjunga Handicrafts Center, Salleybong Bul Cave, Tirikhola Dancing Falls, Temi Tea Garden, Rayong Sunrise View Point and the Tendong State biodiversity Park among others. Nearby attractions from Namchi: Some 5 km from Namchi is Assangthang, a small and unique village that can offer you some really exclusive experiences. There are some 75 huts, brick paved paths in between farmlands, solar lighting system and extremely affectionate villagers who will make your trip wonderful. Things to do in Namchi: Sightseeing is the most important thing that you can do while in Namchi. The town offers quite a lot of places of attraction to look out for. Besides, you can also go out for trekking and discover the most exquisite beauty of nature. How to reach Namchi: Namchi is located some 90 km from New Jalpaiguri, so the nearest railway station is New Jalpaiguri Station. But if you go by plane, then the nearest airport is Bagdogra which is about 96 km from Namchi. Best time to visit Namchi: You can visit Namchi anytime of the year. However, if you want to see the annual flower show that displays a wide variety of rare orchids organized by Namchi garden, then you must visit during the month of February. Lodging and dining facilities at Namchi: There are numerous private hotels of different budgets in Namchi. Dining facilities are available in most of the hotels. You would also find roadside eateries selling local dishes in Namchi.